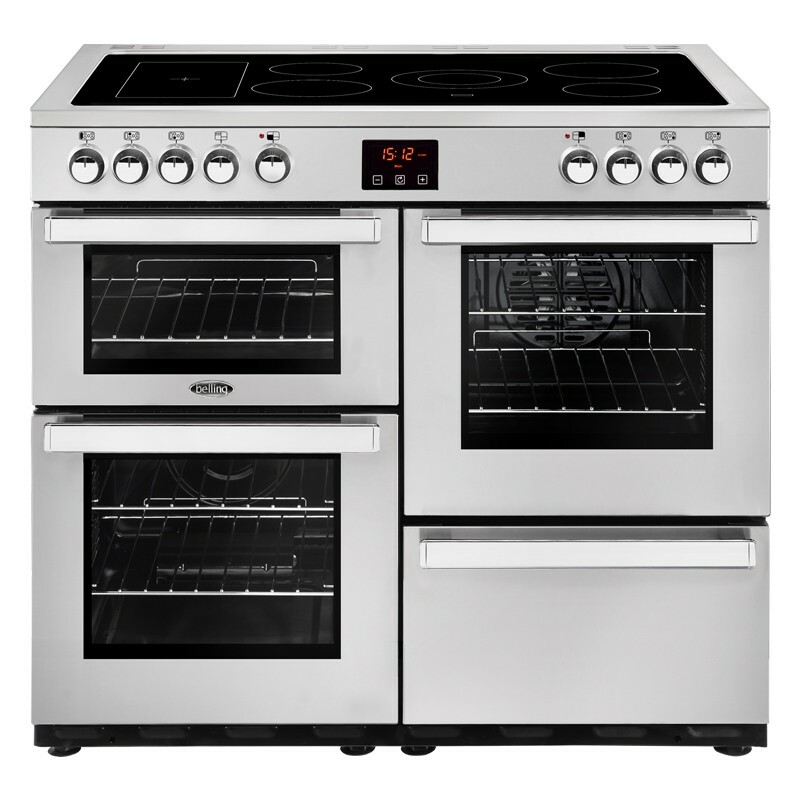 The Belling Cookcentre 100E 100cm Professional Steel Range Cooker is an electric range cooker with six ceramic hobs on top with three different sizes of hobs for a variety of different pots and pans. The top left compartment of this range cooker is a variable grill, with temperature control that can be altered by selecting a high or low setting, this is ideal for a range of foods, from bacon to crumpets. Open door grilling also allows the air to circulate, so the food truly grills, and does not bake. Below that is a 64 litre conventional oven with 2 shelves and five shelf positions and on the top right hand-side is a 62 litre fan oven that distributes the heat evenly through the use of an integrated fan. It creates an even temperature and keeps those flavours from intermingling – so now you can bake your favourite cake at the same time as your cut of meat. It works by drawing in and distributing air through vents, producing an even cooking temperature throughout the oven. So cooks and bakers can use all levels of the oven instead of swapping shelves. The fan also assists defrosting by circulating room temperature air around the food, it is more hygienic and is done in half the time. Perfect to defrost foods such as cakes and gateaux's or if you leave the oven door open it can be used to cool food before refrigeration.